I finally finished a UFO and looked at the small stack of 8 tops left to complete. Top left is a Mile a Minute quilt, top right is the remaining UFOs and at the bottom is the finally completed table runner. The table runner is done using Eleanor Burns' pattern Nana's Garden. 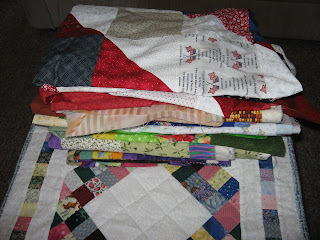 I made 6 blocks back in 2001 to see if I liked the looks before I settled down to make a yellow and blue queen size quilt for daughter Mickey and son in law Eric. 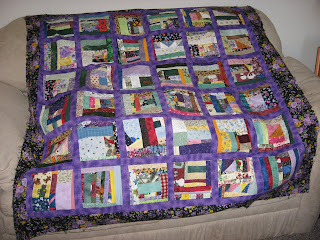 I liked the looks so went on to finish the quilt around 2006. The quilt went to 3 or 4 retreats, Material Girls on Sundays more times than I like to think about and finally went off to Wendy Swears to quilt. I took it to Mickey and Eric the night of my birthday dinner in 2006. Mickey said "Happy Birthday, gimme my quilt." The table runner languished for ages until yesterday when SweetOldBob asked again for a "doily" for his coffee table. 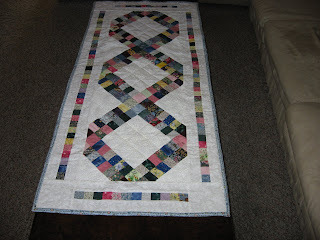 I machine quilted it and sewed on the binding. And it goes on the coffee table on Thanksgiving Day.